Lon McCloskey at The Marine Group tells me that his central listing, the 28.3m Broward Yacht Fisherman Finatic sold on Tuesday, his third successful transaction on this yacht. 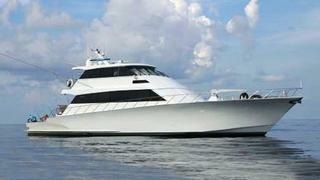 On this occasion Rolla Tichenor at A&M Yacht Sales in New Orleans introduced the buyer. Built by Broward in 1996, she can accommodate 10 guests in 4 staterooms, plenty of room for a cruising family, and is ideal for diving or fishing. She has benefited from many equipment updates and interior/exterior modifications. Finatic was asking $1.3 million. Lon tells me that she is to be renamed Pura Vida and will be listed by The Marine Group for charter in Florida, the Bahamas and the Caribbean.